I am Associate Professor of English in the English Department at Cornell University, where I specialize in the production and reception of literary modernism in the United States, with further interests in media studies and African American literature. My scholarly writing has focused on the collective and institutional forms of twentieth-century authorship that are obscured by the romanticized figure of the individual artist. My book Collecting as Modernist Practice studies the way anthologists, art collectors, and archivists broadly competed over the form of modernism's anticipated institutionalization in American museums and in the academy. 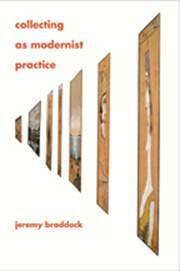 Collecting as Modernist Practice was awarded the 2013 Modernist Studies Association book prize and was a Choice Outstanding Academic Title. I am also co-editor, with Jonathan P. Eburne, of Paris, Capital of the Black Atlantic, and with Stephen Hock co-edited Directed by Allen Smithee. Two recent modernist essays focus on the year 1932: one studies the correspondence of Nancy Cunard and Claude McKay, and examines their joint interest in a rapidly globalizing media environment; the other considers the reception of James Joyce's Ulysses among Harlem intellectuals during the period of the novel's censorship in the United States. I am currently working on a book-length project on the Firesign Theatre. I recorded a podcast for the Organist on KCRW, on the subject of audience practices in the US and Vietnam. And I recently published an essay with Tim Morton, based on our many years of listening to them together. I am also studying libraries and information during the Second World War, a project inspired in part by my work as co-chair of Cornell’s University Faculty Library Board. From 2018-2020 I will be one of the inaugural fellows in the Milstein Program in Technology and Humanity.